In 2014, the West Australian Institute for Deaf Education (WAIDE), operated by the state government, recorded enrollments of 2,100 children who were Deaf or with hearing loss and some 4,000 families subscribing to the service, who could be future beneficiaries of the Centre for Families service. Nationally, there are almost 16,000 Deaf and hearing impaired children under the age of 21 in Australia who are fitted with hearing aids. The challenges faced by these children and young people are highly significant, yet often silent. The risk of having a mental health issue is not associated with the degree of hearing loss. Rather, it is the level of communication and social difficulty experienced that affects mental health. More than 83% of deaf children and adolescents attend mainstream schools where they are often the sole student in their class or school who is Deaf and 90% of Deaf children are born to hearing parents, all contributing to a deaf child’s social isolation. The prevalence and acute impact of hearing loss on the lives of local children, young people and their families is greater than most realise. A report commissioned by the WA Department of Education and prepared by a working group for Deaf Education highlighted these challenges and the importance of family involvement to address issues. 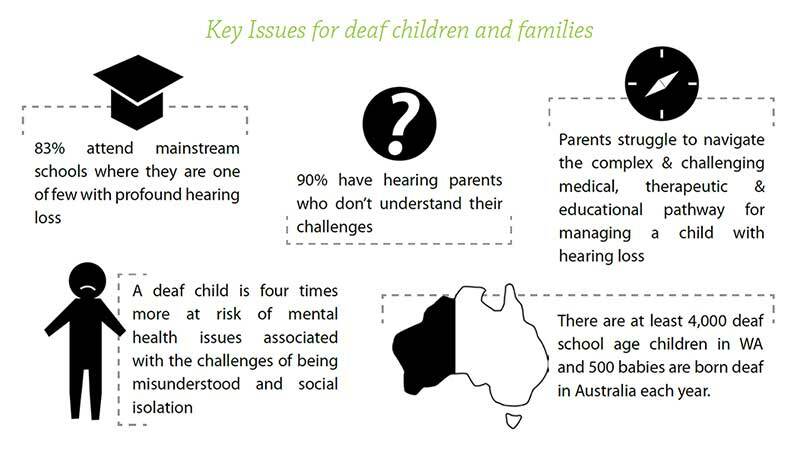 In addition, research has also identified the difficulty for parents of deaf children in navigating the complex range of clinical, therapeutic and educational choices and pathways that meet their needs once a child is diagnosed with hearing loss, particularly when funds are an issue.